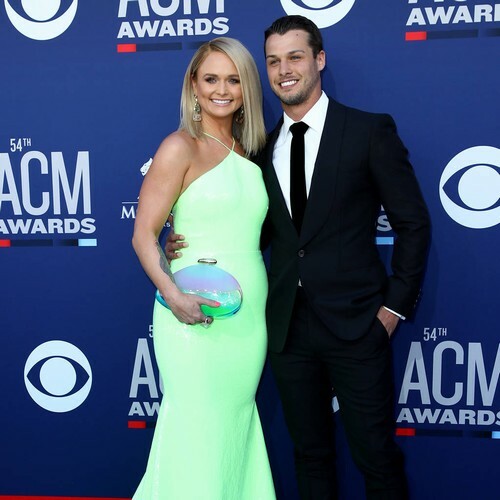 Miranda Lambert made her red carpet debut with her new husband Brendan McLoughlin as they attended the 2019 Academy of Country Music Awards. The singer secretly tied the knot with New York Police Department officer Brendan earlier this year (19), and on Sunday (07Apr19), she and her man walked arm-in-arm as they joined Miranda's country music peers at the annual Las Vegas prizegiving. The couple happily posed for the cameras as Miranda showed off her figure in a form-fitting lime green halter neck gown, while Brendan, 27, sported a classic black suit and tie. Miranda was a double nominee at the event, but lost out on both Music Event of the Year and Female Vocalist of the Year, which she had won for nine consecutive years before Kacey Musgraves took the title at Sunday's ceremony. The star, the most-awarded artist in ACM Awards history, was also among the night's top performers, singing a hits medley and then sharing the stage with the legendary George Strait for the ACM Flashbacks segment, which salutes country music veterans whose songs continue to influence modern acts. Miranda, 35, went public with her surprise wedding news in a post-Valentine's Day (14Feb19) announcement on Instagram, revealing they had become husband and wife after a whirlwind romance. "I met the love of my life. And we got hitched!" she captioned a pair of photos of the loved-up pair on its big day. "My heart is full. Thank you Brendan Mcloughlin for loving me for.... me. #theone". The union is Miranda's second - she was previously wed to Blake Shelton, but they divorced in 2015 after four years of marriage.